To many the goal of the Polaris program seemed unachievable when first proposed: to produce a ballistic missile with a range of over a thousand miles that would be capable of being launched from a submerged submarine. Today a fleet of Polaris-carrying submarines constantly patrols beneath the seas as a key element in a national strategy of deterrence. Harvey Sapolsky examines the Polaris missile program, one of the most costly and successful ever undertaken by the federal government, and describes the bureaucratic strategies the Polaris proponents employed to control the threatening environment. 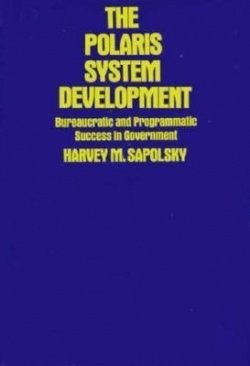 Sapolsky points out that the Program Evaluation and Review Technique (PERT), which gained the program a worldwide reputation for managerial innovativeness, was as much a device to protect the program from external interference as an effective management tool. The book should be valuable to those concerned with bureaucratic politics, management techniques, weapons procurement, and arms control problems as well as to those who seek to understand the operations of American government.